Description: Clear the streets for the performing marching band! When little band leaders pull Tiny Teddy, the bear will move his arms and play a merry little tune on his 3-key xylophone! FPT4303 - Wooden cut-out teddy bear with paper lithographs on both sides of a light brown teddy bear wearing a blue band cap, a blue band jacket with yellow trim, and white pants with yellow stripes down the sides. 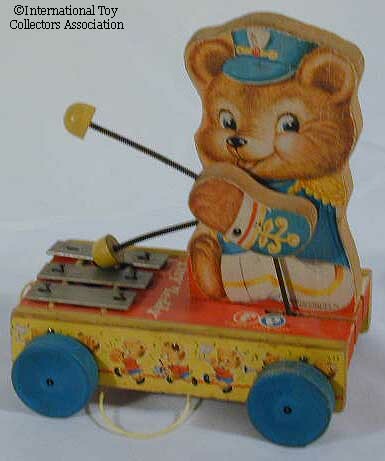 The bear has 2 seperate wooden movable arms with paper lithographs on both sides of blue sleeves and light brown bear hands. Each hand has an attached mallot with a yellow bead on the end. 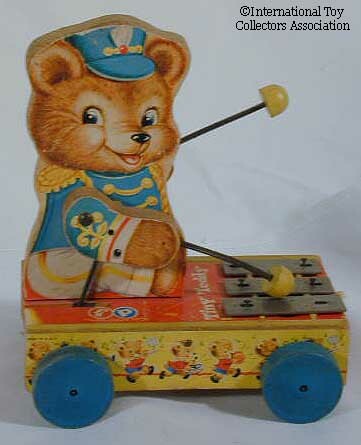 Teddy is mounted on a rectangular wooden platform that rolls on 4 blue wooden wheels and has 3 metal xylophone keys. The sides of the platform have a yellow paper lithographs with pictures of bears playing band instruments. When pulled, teddy swings his arms and plays a song on the xylophone. Measures 6-1/4" long, 7-1/4" high, and 4-1/2" wide. Also see 1955-1957's #634 Tiny Teddy. Also see 1958-1962's #636 Tiny Teddy.